The back door is nearly handmade. 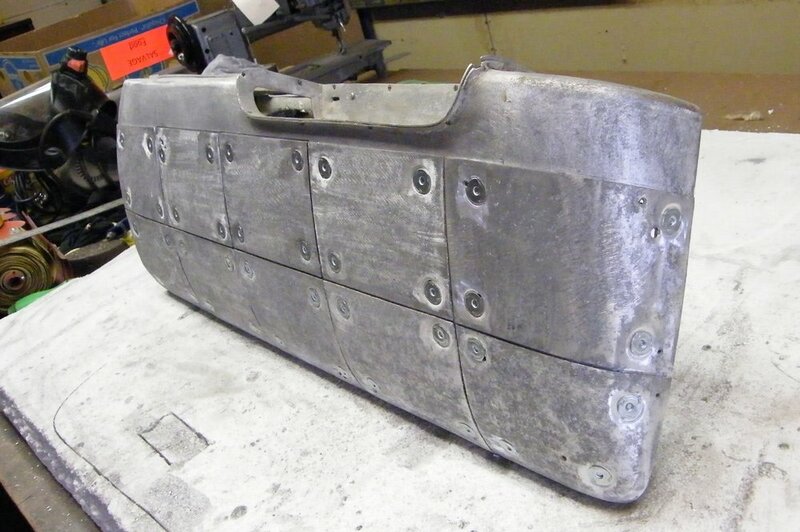 As stated before the interior box of the door is two factory stampings welded together. The outer skin of the door and the roof cut-in is completely fabricated by Ghia. Once again, notice the tasteful rear fin termination at the rear handle. None of the pieces cut off the quarter panel were used to create the door skin. Also the glass and all of the door internals were either fabricated or modified by Ghia to accommodate this 4 inch longer rear door. The door handle has a lock cylinder in it. This is exclusive to Ghia and can only be found on other true factory built limousines. The key is separate from the front door and the ignition. Either giving the rear occupant greater security or the ability of the chauffeur to stand post by the vehicle and unlock the rear door as the principle approached. In 1958 power locks did not exist on Imperials. The rear door panel, like the front door panel, has the scythed leather only now in gray, over the door handle with the same custom chrome end cap. 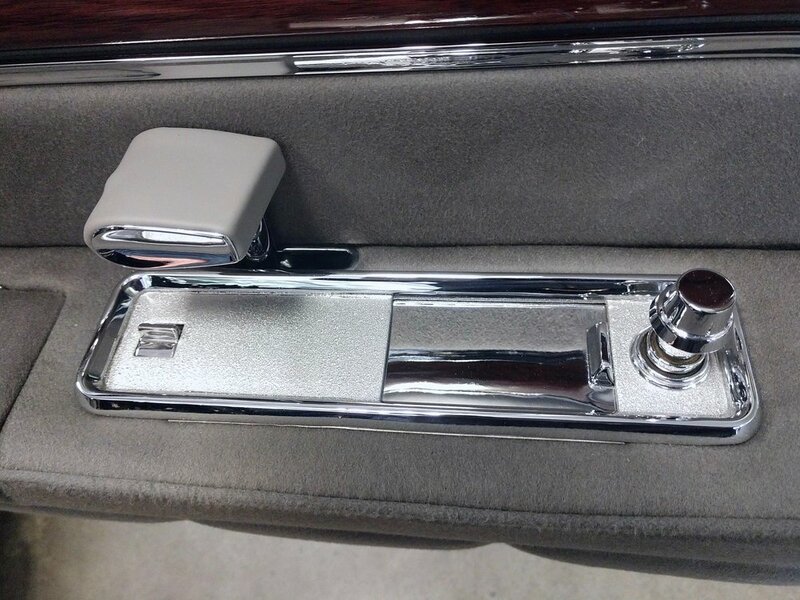 Also, the ashtray/lighter receiver that you see is off of a ‘55-’56 Chrysler built Imperial limousine. The switch at the front of the chrome panel turns the dome light on and off. Standard to all Imperials, when you push forward on the door handle it locks the door and when you pull rearward it unlocks it. Both the front and rear doors function this way. Notice the stippling/argent finish on the ashtray/lighter receiver. The original finish would have been a flat gray paint which matched the interior fabric. The paint was applied over chrome plating so it never stuck very well and would often flake off. I achieved this appearance by accident. After taping up the fresh chrome plating that I was going to paint, I used a media blasting cabinet with aluminum oxide and held the gun as far away from the piece as I could. Originally I was going to rough up the chrome plating for better paint adhesion but it turned out looking like this, so I just kept it. This picture is a wonderful example of the hand crafted nature of these vehicles. This rear door arm rest is made of aluminum and built like the wing of an airplane. Overall construction with welding, grinding, curves everywhere and interior struts demonstrate the expertise that was required to build these cars. The outer panels that you see, screwed to the arm rest base, will eventually be foam covered then individually sculpted and finished with wool fabric. This quilting is everywhere in the rear compartment and is one of four different interiors available in this year’s model. This was the most intricate of the Ghia interiors to produce. This is a reproduction piece. Modifications from the original design are the weld nuts holding the panels in place. Original construction was identical except that tiny screws passed through the panel and were held in place by nuts on the back. 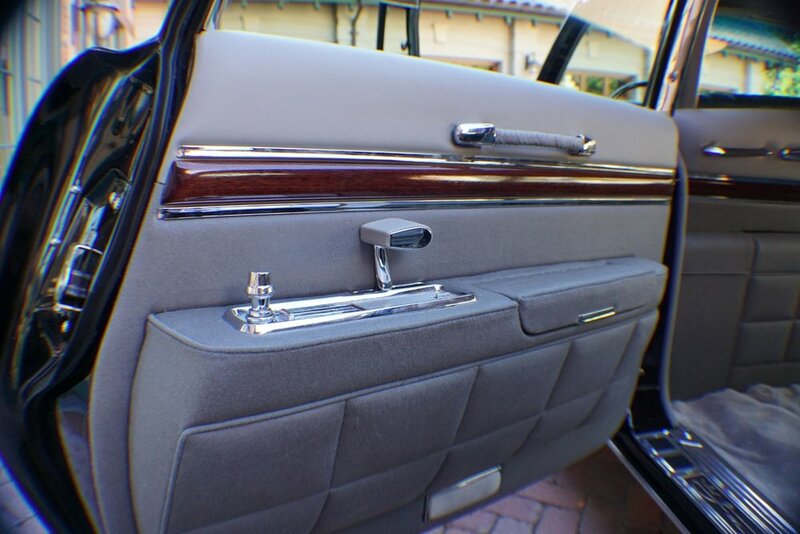 These limo entrance/puddle lamps are on both the front and rear doors of the Ghia. And also, pictured, on this ’55-’56 Imperial limo. Common practice today is to use lamps out of a C3 Corvette. We cast up exact replicas (see Restoration Photo Dump) however the material used in the lens requires us to install non heat producing LED lighting. Closeup picture of our finished reproductions. The bezel is chrome plated and the backing plate is yellow zinc. This demonstrates the foam tapering on all the removable panels. The upper curved part of the panel is the original Ghia produced steel. The flat part of the panel, which is aluminum, was originally Detroit production style fiber board. The chauffeur’s compartment was near stock. 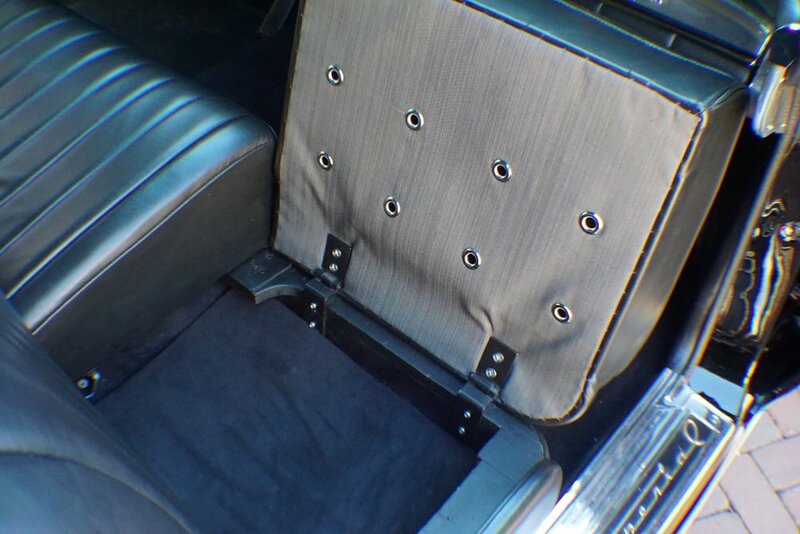 However, the front seat was completely Ghia. The seat was non-adjustable, necessitating the modification to the seat back you see in this photograph. Even with the scalloped seat, if your are over 5’5” it’s a tight fit. 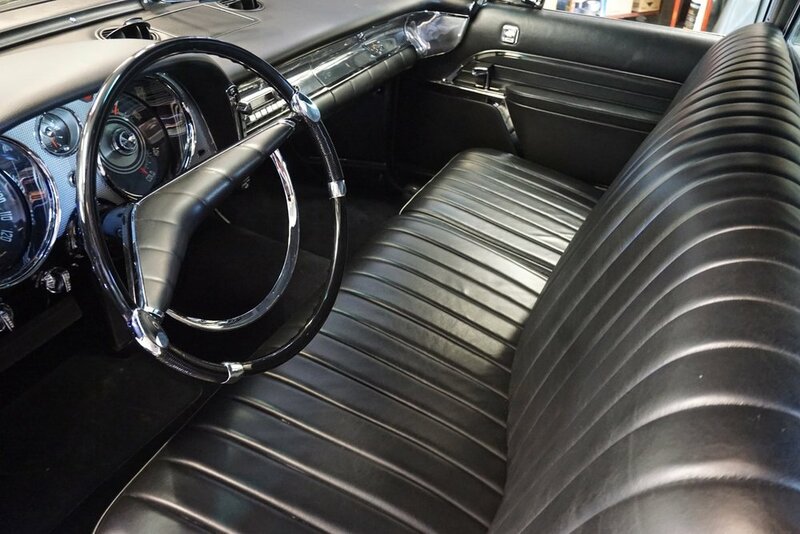 Also, the passenger side cushion has a hidden compartment beneath it, a feature that was on the ‘55-’56 factory built limos. From what I can tell the seat and all its components are Ghia made and production numbered. I can only assume that compartment was supplied for the chauffeur’s personal items such as his hat or gloves. The grommets you see on the bottom of the seat are everywhere under all the upholstery front and back. It is a Ghia specific item and I’m unaware of other cars with such treatment. As practical matter it may have been there to let moisture out and allow the seats to breathe. 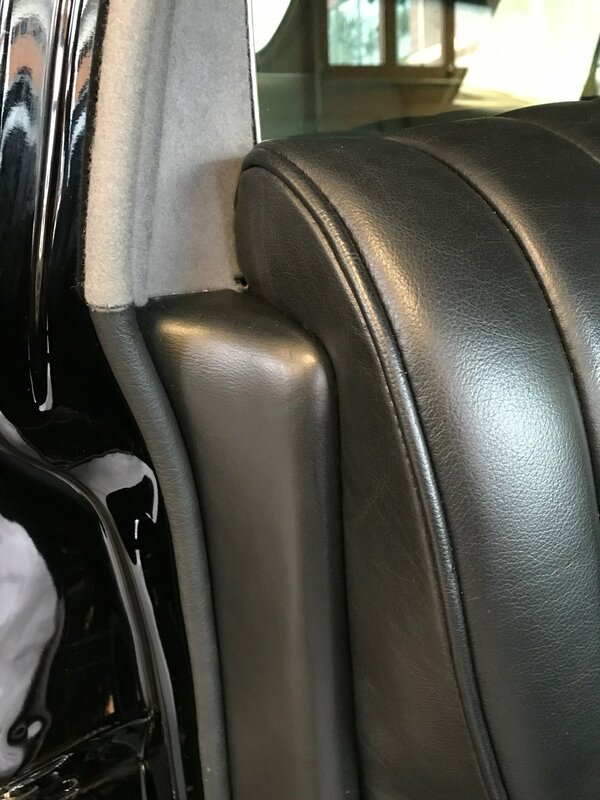 Also of interesting note, on the back seats we would occasionally find Chrysler made “Crowned” seat material used as patch and fill material on non-visible areas. The frame of the seat was completely Ghia built and doesn’t appear to be based on anything the factory made. Here is an example of the ventilation grommets on the rear seat. In 1957 the turn signal switch was a rocker style. In 1958 it went to this paddle style. So one of the Ghia modifications was to replace the turn signal switch to update it to the year the vehicle was titled as. This duct is another 1958 modification and did not exist on 1957 cars, so it was added when the vehicle’s year model changed. Even the kick panels have wood framing, leather covering and replaced the factory plastic unit. 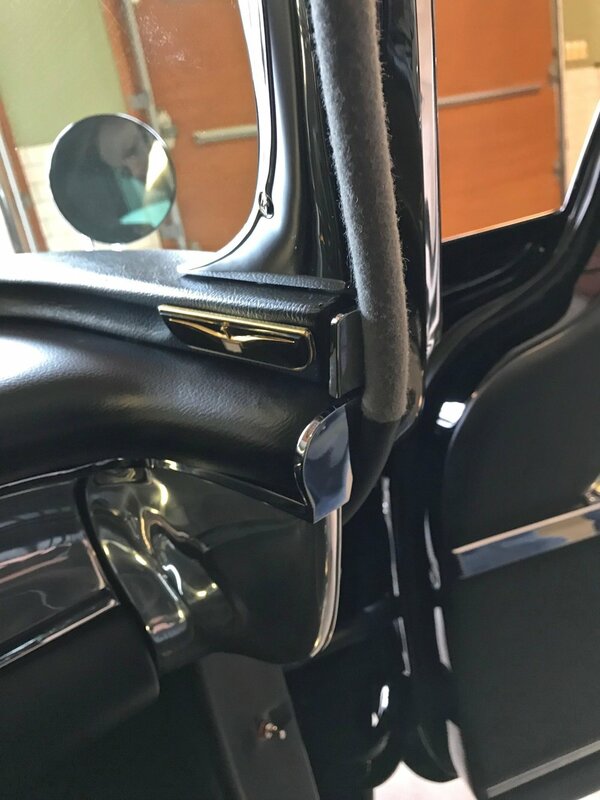 The sun visor pivot mount has been cut away where it would normally extend over the door opening and join another molding which would frame the headliner in chrome. The piece was modified and then re-chromed. The windlace transition from leather to cloth mimicking where the cloth headliner meets the leather seat is an interesting Ghia only detail. The original finish on the face of the metal part of the dash was a light brushed texture that was then bright dipped anodized. We chose a high polish for appearance sake.